Mr Loong Ji Dong wrote to inform that since his letter on 14 May, he noted only the damaged stainless handrail was replaced. However, the peeling paint and color blobs on the walls, damaged noticeboard cover etc had yet to be replaced or repaired. Also the paint color for the exterior wall of the commercial building at Block 140 Teck Whye Lane was not compatible to its original color. He questioned when the delayed Repair & Redecoration works (supposed to conduct every 7 years) would be carried out. Chua Chu Kang Town Council (CCKTC) thanks Mr 龙籍东 for his feedback in “请有关当局回应徳恵巷邻里失修問題” (LHZB, 24 July 2018). I refer to Lianhe Zaobao forum letter Pg19 on 24 July 2018 by Mr Loong Chik Tong. In his letter to the Forum page, Mr Loong wrote that since his letter on 14 May 2018 to the press, he noted only the damaged stainless handrail was replaced. However, the peeling paintwork on the walls etc, had yet to be replaced or repaired. Also the colour of the paint for the exterior wall of the commercial building at Block 140 Teck Whye Lane was not “compatible” to its original colour. He questioned when the Repair & Redecoration works (supposed to conduct every 7 years) would be carried out. Our Town Council staff have been in constant contact with Mr Loong over the localised issues raised by him to the Town Council. We have been sharing with Mr Loong directly on the follow up actions by the Town Council. We are therefore surprised that he has written to the Forum again and gave the impression that he was not updated. The Town Council is in the process of calling tender for the Repair & Redecoration works, which is scheduled to be awarded by late Dec 2018 or early Jan 2019. The scope of the R&R works would encompass the repainting for the walls etc. The noticeboards and the repainting of the commercial building will also be followed up. The Chua Chu Kang Town Council played an active role in ensuring the upkeep of our estate cleanliness and maintenance to provide a clean and pleasant living environment for our residents. All residents who require assistance may either contact us at our one-service hotline at 6569 0388 or email us at info@ccktc.org.sg or submit an online request form at our website. Have you seen Block 1 to 7 Teck Whye Lane’s new look? Every seven years, HDB blocks undergo Repairs & Redecoration (R&R) works to give the estate a fresh new look. Chua Chu Kang Town Council (CCKTC) works closely with the Residents’ Committees (RC) and paint specialists to propose at least three colour schemes for R&R works to our residents. Repairs & Redecoration (R&R) works at Block 1 to 7 Teck Whye Lane commenced in end July 2017 and was completed by end April 2018. 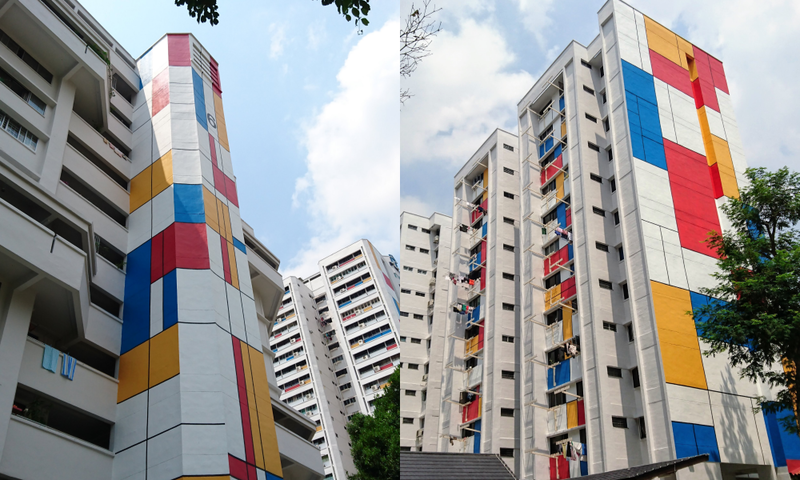 The R&R works included giving the estate a fresh new look by the Piet Mondrian inspired façade and Vincent Van Gogh inspired art murals at the void decks. 75% of the residents selected the Piet Mondrian and Vincent Van Gogh inspired colour scheme while the two other colour schemes received 12% and 13% of the votes, respectively. Colour scheme surveys were distributed to the residents of Block 1 to 7 Teck Whye Lane while artist impressions and descriptions of the three proposed colour schemes were put up on the Town Council Noticeboard at each block. Residents’ Committee (RC) members and Chua Chu Kang Town Council (CCKTC) officers also visited residents to encourage them to vote for their preferred colour scheme. Residents submitted their votes between 09 June to 30 June 2017. Also featured in The Straits Times  , Shinmin Daily News, Lianhe Wanbao and Mothership. After Lift A was shut down on 27 November 2017 for Sigma Elevator to conduct further investigations, Chua Chu Kang Town Council (CCKTC) instructed Sigma Elevator that they had to ensure that the parts needed for the repair works can be flown into Singapore, instead of shipped, so that repairs could be completed by early January 2018 or earlier, instead of February 2018. As a result, CCKTC is pleased to update that on 30 December 2017, repairs on Lift A at Block 805D Keat Hong Close were completed. To ensure that Lift A was functioning smoothly, the lift was closely monitored for 72 hours by the on-site team. On 31 December 2017, CCKTC’s Chairman Mr Zaqy Mohamad, updated the residents of Block 805D Keat Hong Close during a house visit that repairs had been completed and that CCKTC and Sigma Elevator will continue to closely monitor Lift A. Sigma Elevator will also rectify issues, if any, as soon as possible. CCKTC thanks our residents for their patience during this period as we worked closely with Sigma Elevator to ensure that repairs were completed as soon as possible. Since 20 November 2017, Lift A at Block 805D Keat Hong Close has been experiencing multiple breakdowns and Chua Chu Kang Town Council (CCKTC) has been working with the lift contractor, Sigma Elevator on rectifying the issues faced by Lift A. Despite numerous checks and repairs carried out during each breakdown, Lift A continued to malfunction. Lift A was shut down on 27 November 2017 for Sigma Elevator to conduct further investigations. Sigma Elevator has had to extend the maintenance downtime of Lift A due to the complexity of the faults. CCKTC officers conducted door to door visits on 22 December to explain the situation to our residents and to address any concerns that they may have. Initally, Sigma Elevator informed CCKTC on 15 December 2017 that they required more time to restore services to Lift A as the lift parts that were needed to complete repairs have to be shipped, instead of air-flown, to Singapore due to its weight and size. As such, repairs were expected to be completed by February 2018. However, since then, CCKTC has been working with Sigma Elevator on expediting this process. Sigma Elevator has since found a carrier that is able to fly the parts to Singapore. Repairs are expected to be completed by January 2018. The Town Council is closely monitoring Sigma Elevator and the situation closely. Sigma Elevator have stepped up the frequency of their checks and maintenance of Lift B to cater for the increased load and CCKTC have also instructed Sigma Elevator to place a standby team on site 24/7 until Lift A resumes operation. The team will be there to rectify issues, if any, as soon as possible. Since 20 November 2017, Lift A at Block 805D Keat Hong Close has been experiencing multiple breakdowns and Chua Chu Kang Town Council (CCKTC) has been working with the lift contractor, Sigma Elevator on rectifying the issues faced by Lift A. Despite numerous checks and repairs carried out during each breakdown, Lift A continued to malfunction. Lift A was shut down on 27 November 2017 for Sigma Elevator to conduct further investigations. Sigma Elevator has had to extend the maintenance downtime of Lift A due to the complexity of the faults. Sigma Elevator have indicated that they require more time to restore services to Lift A as the lift parts that are needed to complete repairs have to be shipped, instead of air-flown, to Singapore due to its weight and size. As such, repairs are expected to be completed by February 2018. CCKTC officers conducted door to door visits on 22 December to explain the situation to our residents and to address any concerns that they may have. The Town Council is closely monitoring Sigma Elevator and the situation closely. Sigma Elevator have also stepped up the frequency of their checks and maintenance of Lift B to cater for the increased load. A team will always be on standby to rectify issues, if any, as soon as possible. Singapore, 15 December 2017 – As the New Year approaches, Chua Chu Kang Town Council (CCKTC) will offer its annual spring cleaning service. From 18 December 2017, residents can leave their unwanted bulky items at designated areas to be removed free of charge. This service is only for HDB residents of Chua Chu Kang Town Council. 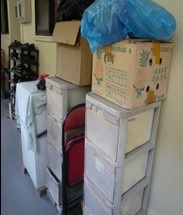 2 This year, the removal service will continue until 14 February 2018 and signs will be placed at the void decks of our blocks to indicate where residents may leave their bulky items. There is no cap on the number of things that residents can discard during this period. Officers will ensure that the designated areas are kept tidy and rubbish is disposed in proper receptacles during their routine inspections. 3 “This initiative was rolled out in 2013 as an added service to our residents as the end of the year is often when many families do their spring cleaning. After receiving numerous positive feedback on the initiative, we decided to offer this service yearly,” said Mr Clarence Tan, General Manager of Chua Chu Kang Town Council. Item(s) obstructing the common corridor. A minimum unobstructed width of 1.2m must be observed for all HDB common corridors. Item(s) placed at staircase and/or at its landing/half-landing. No items are to be left at the staircase and/or its half-landing at all times. 4 In addition, we hope that residents will take advantage of this service to remove any belongings or items that are cluttering and/or obstructing the common areas of their block. 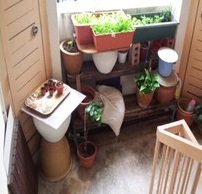 Common corridors, staircases and staircase landings should not be cluttered with bulky articles, bicycles, flower pots, and any other items that may block the passageway. If common areas and firefighting equipment (e.g. dry risers & hose reels) are obstructed, it can seriously hamper firefighting efforts and smooth evacuation in an emergency. 5 Everyone can help to ensure that we create a safe and pleasant living environment for all. Residents are reminded to be socially responsible and to ensure that their belongings do not clutter or obstruct the common areas of their block. The service does not include the following: removal of bulky items thrown away due to house-moving, removal of renovation debris and/or removal of built-in fixtures such as false ceilings and kitchen cabinets. The bulky item removal service is normally limited to three (3) items per household per month. Under BCA’s regulation, the Permit To Operate (PTO) should be put up at all lifts with effect from 1 Sep 2017. Ms Qiu highlighted that there are no PTOs in the lifts at Block 135A Teck Whye Lane and Block 429A Choa Chu Kang Ave 4 multi-storey carpark. The PTO in the lift at Block 430 Choa Chu Kang Ave 4 also expired on 31 Oct 2017. Ms Qiu asked if BCA has been enforcing this regulation. Other than receiving feedback from the public, she also asked if BCA has any other implementation to ensure that the lift operators follow the regulation. Lastly, she questioned how users are to ensure that the lifts that do not have PTOs or have expired PTOs are still safe for use. Chua Chu Kang Town Council (CCKTC) thanks Ms 丘美云 for her feedback in “电梯没贴运行许可证” (LHZB, 9 Nov 2017). 2 In compliance with the latest regulations by the Building and Construction Authority (BCA), Permit To Operate (PTO) certificates were installed in all lifts within Chua Chu Kang Town. However, since the installation of the PTOs, our officers have noticed during their routine inspections that there are lifts where the PTOs have been removed or vandalised. Our officers will then replace these missing or vandalised PTOs immediately. In addition, we are currently reviewing the CCTV footage of all affected lifts to identify the culprits who removed or vandalised the PTOs and have also reported these incidents to BCA. Lastly, we are progressively implementing permanent PTO holders across all lifts within Chua Chu Kang Town. 3 CCKTC takes a serious view of these offences and we seek our residents’ cooperation to practice socially responsible behaviour so as to create a safe and pleasant living environment for all. Meanwhile, our officers will continue to conduct checks to ensure that valid PTOs are installed in all lifts within Chua Chu Kang Town. Residents who wish to provide feedback can contact CCKTC at 6569 0388 or info@ccktc.org.sg. I submitted a forum letter on 1 Sep regarding the emergency lighting in lifts but have not received a reply thus far. An agency being transparent towards public feedback is a basic service that will help improve the agency’s image. I note that it is important to resolve the safety concerns in older lifts by promptly upgrading or replacing the lifts. The display of the monthly lift inspection & maintenance schedule, ensuring that the lifts are in working order, and responding to feedback regarding emergency lighting in lifts are all routine works. Choa Chu Kang Ave 4 which was built in May 1993 was selected for the Selective Lift Replacement Programme. However, the lifts at Block 430 and 439 were not included in the Selective Lift Replacement Programme and I want to know why is this so. These are topics which the residents are concerned about and I hope that HDB and Chua Chu Kang Town Council can give a prompt response. We refer to Mr Loong Chik Tong’s letter “为何不回应蔡厝港组屋电梯反馈”, that was published on 23 October 2017. 2 On 17 August 2017, Choa Chu Kang Town Council (CCKTC) had received feedback at 5:40pm that the emergency lighting and ventilation fan of the two lifts at Block 430 Choa Chu Kang Avenue 4 had malfunctioned. When CCKTC’s lift contractors arrived on site at 6:00pm, it was observed that the emergency lighting and ventilation fans were working. Nonetheless, the lift contractors carried out additional checks to ensure that the emergency lighting and ventilation fans were in proper working order. 3 Mr Loong highlighted in his forum letter that he did not receive a reply after providing feedback on the emergency lighting and ventilation fan malfunction. However, this is not true. In fact, Mr Loong was informed of CCKTC’s follow up actions on the same day by our Property Manager and Lift Manager in two separate phone calls. 4 In his first letter, Mr Loong had also given feedback about the lack of lift servicing schedules. There was a recent revision in the lift servicing schedule for Blocks 429 to 441 Choa Chu Kang Avenue 4, and CCKTC had put up the updated schedules on the notice boards by 1 September. 5 On lift upgrading, all the units in the two blocks mentioned by Mr Loong are already served by lifts that stop on every floor. The only exceptions are two units on the second storey, which do not have access to the common corridor where the lifts are located, due to site constraints. Residents of these units can access the lift on the third storey via the staircase. HDB notes Mr Loong’s suggestion for the lifts to be included as part of the Selective Lift Replacement Programme, and will keep residents informed of any upgrading plans for their block. Chua Chu Kang Town Council (CCKTC) is aware that water supply was temporarily disrupted due to low water level for about 30 minutes at Block 297C and 297D Choa Chu Kang Ave 2 on 29 Oct 2017. Our plumber was activated immediately upon feedback on low water pressure to conduct a thorough inspection on site and determined that a water pipe had burst. Notices were issued door to door to all residents to notify them of the issue and the rectification that CCKTC was conducting. The source of the burst pipe was eventually found near the lift lobby of Block 297D Choa Chu Kang Ave 2. CCKTC will be conducting further repairs to the burst water pipe today (30 Oct 2017) and will continue to monitor the situation closely. Due to natural sediments in the water tank, residents may have had brownish water following the incident. Flushing of the water tank and pipes has since been conducted. 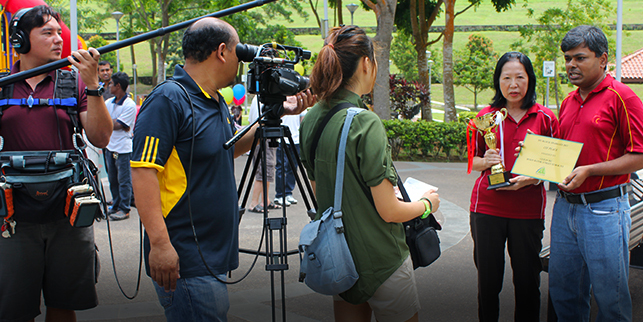 Residents who wish to provide feedback can contact CCKTC at 6569 0388 or info@ccktc.org.sg. Mandatory annual cleaning and flushing of the water tanks at Blocks 711 to 717 Jurong West Street 71 was conducted from 9am to 6pm on 9 and 10 October 2017 and as such, water was discharged into the apron drain during the flushing process. In this instance, due to the installation of a new mesh which is a pest prevention measure, the pressure of the water being flushed out through the mesh caused the temporary water sprout. Going forward, Chua Chu Kang Town Council (CCKTC) will be regulating the flow of water from the water tank during flushing works to ensure that the water discharged will not cause a water sprout. Residents who wish to provide feedback can contact CCKTC at 6569 0388 or info@ccktc.org.sg. Members of the public can also contact PUB’s 24 hour Call Centre at 1800-CALL-PUB (1800 2255 782) to provide feedback on leaks and other water-related matters. I noticed water leakage at the grass patch area on the way leading from Teck Whye Ave 6 to the main road in mid Sep. The water leakage might be due to the faulty water control tap in the box on the grass patch or an underground water pipe burst. I reported the matter to Chua Chu Kang Town Council on 18 Sep and told the counter staff the exact location of the water leakage. The water leakage was still present after a few days. On 22 Sep, I reported the matter to the Town Council again. The same counter staff told me that the plumber had been unable to find the location or contact me. Even though the plumber was unable to contact me, the Town Council should have followed up with the matter as I had told them the location of the leak. I told them the exact location of the water leakage again and the staff in-charge told me that it might be dirty water flowing out. However, I think that they should still find out the root cause of the leak even if it is dirty water. Furthermore, the location of the water leakage is not difficult to locate as it is at the Block 6 and Block 4 carpark entrance. In early Oct, I noticed that the water is still flowing at the area so I contacted the Town Council on 5 Oct. I feel that my previous feedbacks have not been handled properly and insisted on speaking to the manager to feedback about my disappointment. I am not a resident of Teck Whye, I am just a citizen who does not want to see water being wasted. Three weeks have passed, why hasn’t Chua Chu Kang Town Council resolved the matter? Chua Chu Kang Town Council (CCKTC) thanks Ms 曾凤瑛 for her feedback in “为何不认真处理漏水反馈” (LHZB, 7 Oct 2017). 2 We wish to assure Ms 曾凤瑛 that each feedback that CCKTC receives is taken seriously and would like to take this opportunity to highlight the steps that we had taken following each feedback. 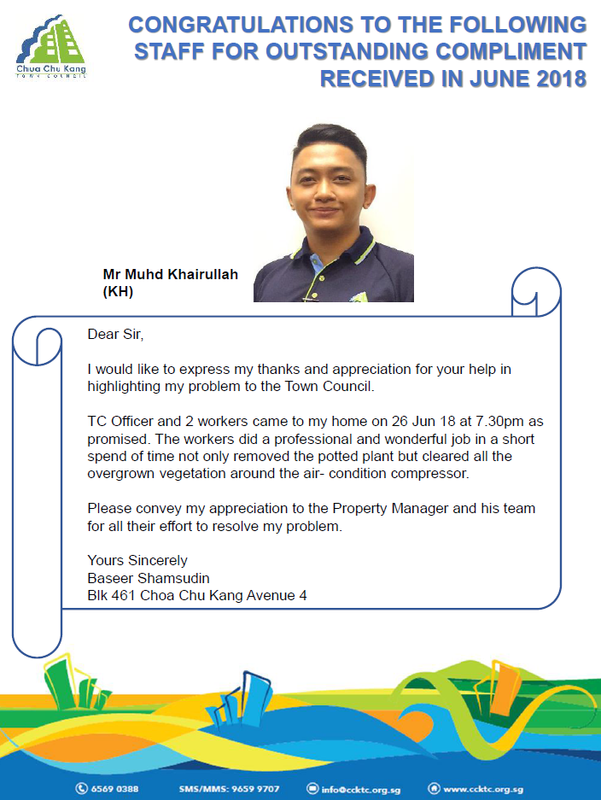 Following the first instance of feedback on 18 Sep 2017 that there was a leak at Block 4 Teck Whye Lane, CCKTC deployed our plumber immediately to detect and rectify the issue. However, the leak could not be found and we were unable to contact Ms 曾凤瑛 to seek more details on the leak despite multiple phone calls made on 18 and 19 Sep 2017. The second instance of feedback was received on 22 Sep and CCKTC was informed that the leak was at Block 6 Teck Whye Lane. Our plumber was deployed on site again but the leak still could not be found and we were unable to contact Ms曾凤瑛 even after attempting to contact her several days after the feedback was received. The third instance of feedback was received on 5 Oct 2017 and with more details provided and further checks, our plumber was able to identify the source of the leak. CCKTC promptly contacted PUB and PUB rectified the leak on the same day. PUB has also checked the surrounding areas and no further leaks were detected. 3 CCKTC will continue to improve our processes in order to deliver better service to our residents and we would like to thank Ms 曾凤瑛 for her valuable feedback. Residents who wish to provide feedback can contact CCKTC at 6569 0388 or info@ccktc.org.sg. They can also contact PUB’s 24 hour Call Centre at 1800-CALL-PUB (1800 2255 782) to provide feedback on leaks and other water-related matters. We refer to the article published in Shinmin Ribao (Page 1) on 3 December 2016 on the lift malfunctions at Block 803B Keat Hong Close. The Town Council would like to address the concerns raised in the article. HDB and Chua Chu Kang Town Council are aware of residents’ feedback on the lift malfunctions and have been working together to address the feedback. Based on our records, there was a total of three cases of lift breakdowns at Blk 803B Keat Hong Close in October and November for each of the two lifts. At all times, at least one lift was in service. We have instructed the lift contractor to carry out additional lift servicing and other improvement works where necessary. HDB and Chua Chu Kang Town Council will continue to work together to monitor the lift performance. Chua Chu Kang Town Council has been using the diesel operated high pressure water jet machine to flush the sewer lines and manholes at Teck Whye Neighbourhood Centre recently. The revolution per minute (RPM) of this type of machine can be up to 3600 RPM which causes loud noises. We know that long term exposure to loud noises is unhealthy and the workers are not equipped with ear plugs. While we understand that the machine is energy saving and efficient, for the health of the workers and living environment for the residents, especially during the exam period, we need a quieter environment. The Town Council should better control the noise pollution and reduce it by adding better cushion or muffler to the machine. The Town Council would like to thank Mr Loong for his feedback and apologise for any inconvenience caused. We received Mr Loong’s feedback via email on 3 Nov 2016 and have directly responded to him on 4 Nov 2016. The Town Council will always put our residents’ welfare as a priority. Thus, to ensure a clean and hygienic neighbourhood for all, we would conduct the flushing of sewer lines and manholes using the diesel operated high pressure water jet machine (standard equipment used) once a year to prevent chokage or if a chokage occurs. We will be mindful to carry out such flushing works where possible during non-examination periods and do our best to minimise the noise created in the future. We will also look into giving our workers ear plugs during the flushing works to protect them. We are grateful for the feedback and will continue to work together with our residents to improve our living environment. A resident staying at level 15 of Block 484D Choa Chu Kang Ave 5 reported that rats have intruded her unit, fed on instant noodles and rice, bit on paper bags and wooden doors, and left feces around. Another resident staying at level 16 of the same block mentioned that he once saw a rat trying to enter his unit but the metal netting at the metal gate prevented it. He also spotted rat feces outside his unit. Residents believed that the rats came from the forested area beside the flat and have climbed up via the water pipes. They also mentioned that they have seen rats at the ground floor central refuse chute area. The Town Council has been carrying out an intensive rat eradication program in the vicinity since the beginning of September, as an enhanced rat control measure to keep the rat problem at bay. As of this year so far, there has only been two reported rat sightings in this precinct. In our recent audit by our pest control specialist, there have been no active burrows found in this area. Upon receiving the feedback about this recent rat issue from a resident, the Town Council has sent our staff to investigate the matter. We have deployed rat traps in the common areas on level 14, 15 and 16, while our staff conducted house visits to the residents on level 14, 15 and 16, to find out if they have encountered any rat issues and their concerns. Residents are encouraged to inform us if they have any rat sightings, so that we can investigate and help to eradicate the rats. We have advised residents to maintain proper housekeeping and not leave food sources exposed, and will continue to closely supervise the estate cleanliness and work with the residents to keep the estate free from rat activity. This story was also published on The Straits Times, 28 September 2016 subsequently. My previous letter to the forum on 16 July 2016 enquired when will the NRP commence, and CCKTC answered that preliminary works will begin in Q4 this year. Previously I feedback to CCKTC that the sheltered structure at Teck Whye Lane Blk 142 was mouldy, dirty and very unsightly, and they promptly arranged to clean it up. A few days ago, I discovered that the structure was given a fresh coat of paint. However this structure is scheduled to be replaced by a more beautiful and functional structure as part of NRP. So why is public resources wasted to paint it when this structure will soon be taken down? Unless we are going to retain this structure? This will not be what the residents would like. The Town Council would like to thank Mr Loong for his feedback. The Town Council takes measures with the residents’ welfare as a priority. The sheltered structure was moldy and dirty, and we cleaned and repainted it, so that the health and safety of the residents are not compromised. We decided that the health risks outweigh the costs in the interest of our residents’ health. We continue to work with residents on improving their living environment and thank them for their understanding and support. Dr Amy Khor, Senior Minister of State, Ministry of Health & Ministry of the Environment and Water Resources, MP for Hong Kah North SMC, visited Block 414 Bukit Batok Ave 4 on Tuesday, 16 August 2016. During the visit, Dr Khor stressed that all premises’ owners must ensure that preventive measures are put in place to prevent rat infestation. The key strategy in preventing rat infestation is to remove food sources and areas of harbourage which can be done by maintaining the cleanliness of the environment and practising good refuse management. Individual and collective efforts among multiple stakeholders, such as NEA, Town Councils, and foodshop operators, are necessary to ensure a more holistic and expeditious effort in resolving the rat infestation. Foodshop operators will need to work with their respective Town Councils as well as NEA to ensure good pest control practices, proper housekeeping and refuse management to prevent rat infestation. The media visit was reported on Channel 8 news and The Straits Times on 17 August and Lianhe Zaobao on 18 August. 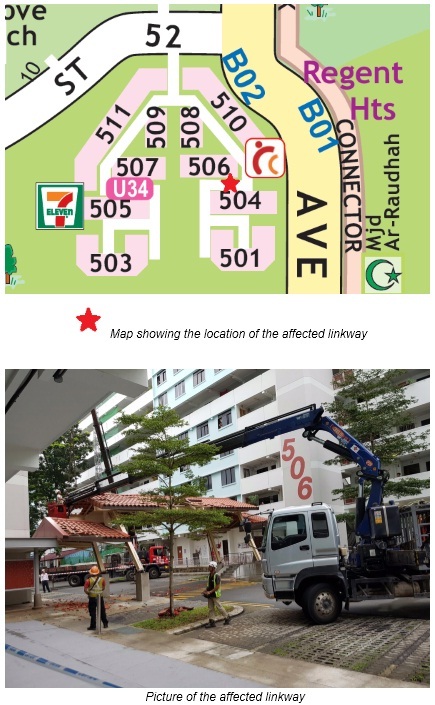 At about 3.00 pm on 20 July 2016, a haulage truck that failed to retract its attached crane crashed into the covered linkway linking Block 504 to 506 at Bukit Batok St. 52, causing it to lean sideways. The Singapore Civil Defence Force and the police were notified. No one was injured. The safety of our residents is our first priority. The affected area has been cordoned off, while we work on dismantling the entire linkway and will reconstruct it at a later date. We will also perform checks on the adjacent buildings to ensure that their structural integrity were not affected by the incident. We thank the affected residents for their patience, and will keep them informed of reconstruction works to the affected linkway.